Every content creator has important milestones they want to reach, whether it be a certain number of subscribers or a high view count. For many, the first important goal is to reach one thousand subscribers. Reaching a thousand subscribers opens up a thousand new doors for a content creator. As long as you also have four hundred hours of watch time, your channel becomes eligible for monetization. You’re also likely to keep growing and reaching new viewers, as well as having the foundation for a strong fan base in place. However, like any goal, reaching a thousand subscribers takes some work. Though it may seem overwhelming when you first start, once you fall into the right rhythm, you channel will grow right before your eyes. Start your channel off right with consistent uploads. Whether you have ten people watching or ten million, you’ll get and keep more viewers if you upload new videos on a regular basis. In fact, many vloggers have found that, if they fail to upload consistently, their channels fall out of favor with the YouTube algorithm. As a result, their videos may not show up as recommendations to new viewers or rank highly in search results. You can also attract more viewers by creating content within a very specific niche. Then, you can build a strong community of viewers who share a common interest. Both consistent uploads and niche content will help improve your watch time score. When a viewer gets hooked on one video, they may continue watching similar content on your channel. Uploading consistently ensures that viewer has plenty of videos to binge. Think of growing an online audience as tending a garden. No matter how many seeds you plant, you won’t have much of a harvest if you’re not watering or weeding your garden. As your audience grows, maintain a good relationship with them through engagement. Start with social media. Respond to their DMs. Reply to their tweets and Snapchats. If a fan tags you on Instagram, go like and comment on the picture. You can take it a step further by following back especially active fans. This will be a great incentive for other fans to interact with you more. If you’re able, take your audience engagement offline with a meetup. Plan a small gathering at a public place in a large city near you. Give your audience the time and date well in advance. Alternatively, you may also consider opening up a P.O. box for viewers to send you mail. You can open their packages in a video and reply to their letters as you’re able. You can get the best of both worlds through a live stream. By going live, you can interact with your fans in real time from anywhere you have an internet connection. Do a Q-and-A, talk about your day, or just chat and get to know your new fans. YouTube is a heavily saturated platform. Viewers have a seemingly endless stream of content to choose from, so you have to make sure your videos stand out. Clickbait is a controversial but crucial aspect of growing any YouTube channel. If you take things too far, no viewers will trust you, but if you’re careful, you can generate enough interest without the backlash. The general rule for responsible clickbait is to always deliver on your promise. Don’t take things too far out of context or exaggerate too much. Most importantly, never, ever lie. Good clickbait boils down to creativity. How can you word your vlog title to sound like a tabloid headline? Can you edit your thumbnail to create a surprise? The majority of successful YouTubers didn’t become overnight sensations. 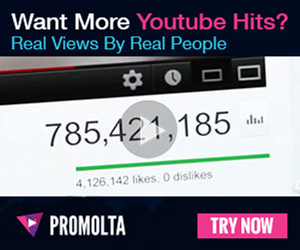 Rather, they’ve been uploading videos for years. Many of them didn’t hit it big time until several years into their careers. Looking to your favorite creators as inspiration, never give up on your YouTube dream. Stay focused on your goal, no matter how slowly success comes. You’ll never reach one thousand subscribers if you quit trying. You’ll also need to stay dedicated. Social media can be stressful, so remember why you started in the first place. Keep in mind where you started as you visualize where you’re headed next. Getting your first one thousand subscribers boils down to creativity and perseverance. Keep uploading consistently and engaging with your viewers. Like animate cartoon. Here some confused stood that how the video is copyright or how to check copyright contend on video. Help me any other technique on animation. Check me out, unsigned artist from Texas, Caleb B.